Henry “Box” Brown was born enslaved in Louisa County, Virginia in 1815. When he was 15, he was sent to Richmond to work in a tobacco factory. His life was filled with unrewarded drudgery, although he had it better than most of his enslaved peers. The loss of freedom prevented him from living with his wife, Nancy, who was owned by a slave master on an adjacent plantation. She was pregnant with their fourth child when, in 1848, he heard the tragic news: Nancy and his children were to be sold to a plantation in North Carolina. He stood with tears in his eyes on the side of the street as he watched 350 slaves in chains walk by him, including his wife with their unborn child and three young children. He could only wish them a tearful last farewell— he was helpless to save them. After months of mourning his loss, Henry resolved to escape from slavery. He was a man of faith and a member of the First African Baptist Church where he sang in the choir. He acknowledged that, through his faith in God, he was given the inspiration and courage to put together a creative plan of escape. Henry enlisted the help of his choir-member friend, James Caesar Anthony Smith, a free Black who knew Samuel Alexander Smith, a White sympathizer. (They were not related but had the same last name.) Samuel Smith liked to gamble and, for a profit, agreed to help Henry Brown with his plan. The plan that Henry envisioned was for himself to be shipped in a box by rail from Richmond to Philadelphia, a very creative, unique, and dangerous endeavour. Samuel Alexander Smith in turn contacted James Miller McKim, a White abolitionist and seasoned member (along with William Still) of the Philadelphia Anti-Slavery Society. Samuel Alexander Smith shipped Henry by Adams Express Company on March 23, 1849, in a box 3 feet long by 2 feet 8 inches deep by 2 feet wide, and sent the box as “dry goods.” Henry Brown traveled in the box lined with baize, a coarse woollen cloth, carrying with him only one bladder of water and a few biscuits. There was a hole cut in the box for air, and it was nailed and tied with straps; in large words, “This side up” was written on the box. 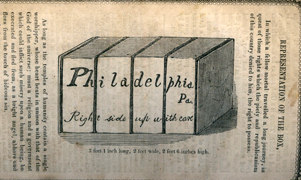 Brown traveled by a variety of wagons, railroads, steamboats, ferries, and finally, for added safety, a delivery wagon that brought the box to the Philadelphia Anti-Slavery Society before daybreak. During the 27- hour journey, the box was turned upside down on several occasions and handled roughly. Henry wrote that he “was resolved to conquer or die, I felt my eyes swelling as if they would burst from their sockets; and the veins on my temples were dreadfully distended with pressure of blood upon my head.” At one point, Henry thought that he might die, but fortunately two men needed a place to sit down and, “so perceiving my box, standing on end, one of the men threw it down and the two sat upon it. I was thus relieved from a state of agony which may be more imagined than described.” The box with Brown in side was received by William Still, James Miller McKim, Professor C.D. Cleveland, and Lewis Thompson. Upon the box being opened, Brown said, “How do you do, Gentlemen?” then recited a psalm: “I waited patiently on the Lord and He heard my prayer.” He then began to sing the psalm to the delight of the four men present, and was christened Henry “Box” Brown. Samuel Alexander Smith attempted to ship more enslaved from Richmond to Philadelphia on May 8, 1849, but was discovered and arrested. In November of that year, he was sentenced to six-and-one-half years in the state penitentiary. James Caesar Anthony Smith, the free Black, was also arrested on September 25 for attempting another shipment of slaves, but he fared better. The trial that followed resulted in a divided panel of magistrates, and James Caesar Anthony Smith was released and later joined Brown in Boston. The abolitionist movement of the day held two opposing points of view. Frederick Douglass made it clear that Henry Brown’s escape should not be made public, as others could use this same method. However, others thought that the publicity would help the movement, and that it was just too good a story to keep from the growing number of the public who opposed slavery. Henry Brown was intoxicated with the feeling that freedom brought, and his personality would not allow him to remain quiet about his achievement. He was his own man and a working class individual. He used this miraculous event to make a new life for himself. He also used his great imagination to support himself. In May 1849, Henry appeared before the New England Anti-Slavery Society Convention in Boston, where he left no doubt in the minds of the audience that the enslaved desired freedom. Brown also became a performer, often reciting the psalm he had sung when he first emerged from the box. 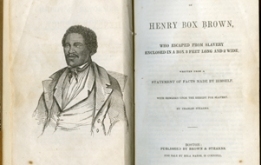 In September 1849, the narrative of Henry “Box” Brown was published in Boston by Charles Stearns. Henry “Box” Brown again showed his creativity late in 1849 when he hired artists and others to begin work on a moving panorama about slavery. 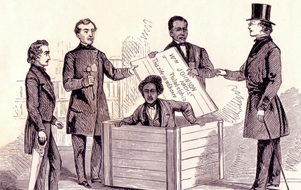 In April 1850 Henry “Box” Brown’s “Mirror of Slavery” opened in Boston and was exhibited throughout the summer. 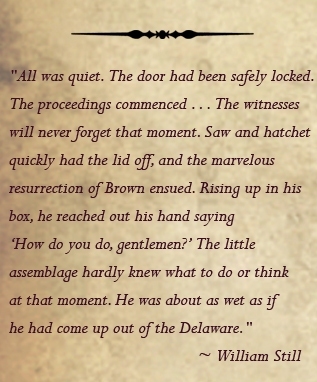 With the passing of the Fugitive Slave Act on August 30, 1850, it was no longer safe for Brown to remain in the Northern Free States, as he could be captured and returned to Virginia. Therefore, he sailed for England in October 1850. His panorama was exhibited throughout England. In May 1851, Brown’s own “First English Edition” of the narrative of his life was published in Manchester. All, however, was not well for Henry “Box” Brown. He was being criticized over finances and for not trying harder to purchase his own family. 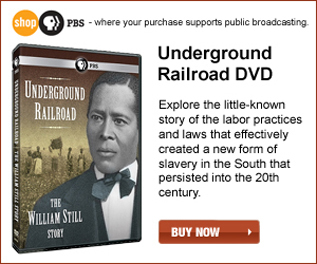 Thus, Brown left the abolitionist circuit completely and embraced English show business for the next 25 years. He married in 1859, and in 1875, accompanied by his wife and daughter Annie, he returned to the United States. He performed as a magician and continued to climb into his original box as part of his act throughout the eastern United States. Brown’s last performance is reported to have taken place in Brantford, Ontario, Canada as stated in a Brantford newspaper on February 26, 1889. No later information on Henry “Box” Brown and his family has been discovered. The date and location of his death are unknown.